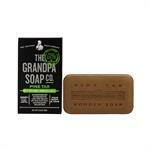 Grandpa's Pine Tar bar soap is the original wonder soap. Ideal for showering, shampooing and facial grooming, this 3-in-1 wonder soap is made with natural pine tar oil to deeply cleanse, deodorize and moisturize from head to toe. Choose bar size. 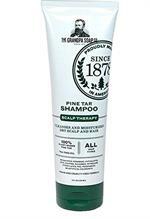 Helps remove flakes of dandruff, seborrhea, and psoriasis. Safe, effective for all hair types and colors. Lathers white. Same great natural moisturizing action as the bar for those who prefer a liquid. Lathers white, rinses clean. No phthalates, sulfates, edta, animal by-products, artificial fragrances or colorants.